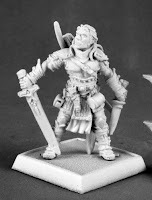 Today, I cover a few things: the continuing search for a captain model for my "human" mercenary warband, and further ruminations on putting together a dwarf warband from the models I already own. I love fluff in games. In fact, I've always been more interested in the fluff of warhammer than the playing of it. 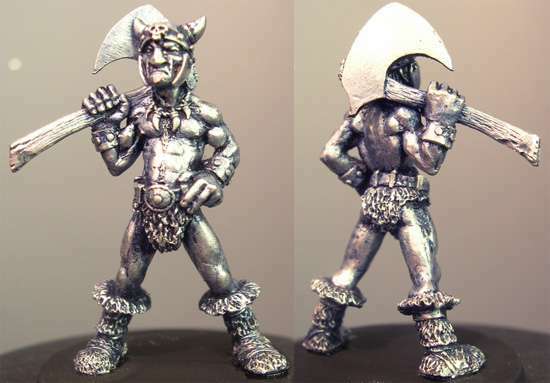 So as I was browsing through the miniatures looking for warriors, I was already entertaining some vague ideas about background for my group. 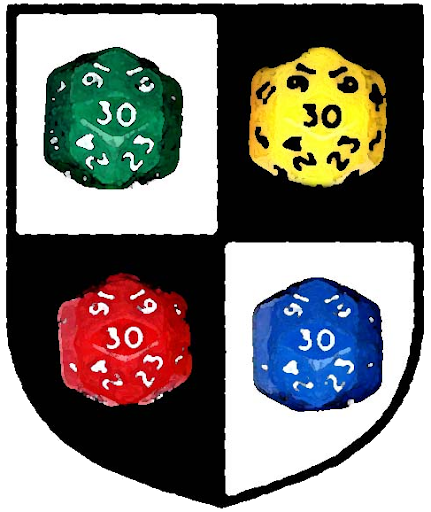 Half the warband is half-orcs or other half-breeds, so that would suggest a group of outcasts, the dregs of society forced into mercenary work through a combination of an aptitude for violence, and a lack of other options. They'd probably be lead by a human, if I can find one (see below), as he'd be the one who would talk to employers. Some warhammer nuts in the audience (assuming we have any) might point out that warhammer doesn't have half-orcs. Of course, those pointing that out obviously weren't around for 1st-edition Warhammer Fantasy Role-play, which did. Along with Gods of Law, the one-eyed-mist-exuding Fimir, Khorne being shown to be a god of valour, Halfling Wizards, and all kinds of other stuff I find quite entertaining, and miss. So nyah. The Mordheim rulebook makes a bit of a point about the captain of your warband being, in a way, a representation of the warband's player. So really, you have to pick a model you really like. Which is making that selection a bit hard for me. I like all the models I've outlined for my warband so far, but none of them really look like leader material. Sure, most of the half-orcs look big and imposing, but this isn't an orc group, the leader isn't the guy who can beat everybody else into submission. He's the guy who has a plan. Being able to wallop those who aren't cooperative is helpful, but the plan is the main thing, so the model has to look somewhat imposing, and possibly a bit older than everybody else, to show he's a cunning old veteran. Finding a model to those sort of specs isn't easy. 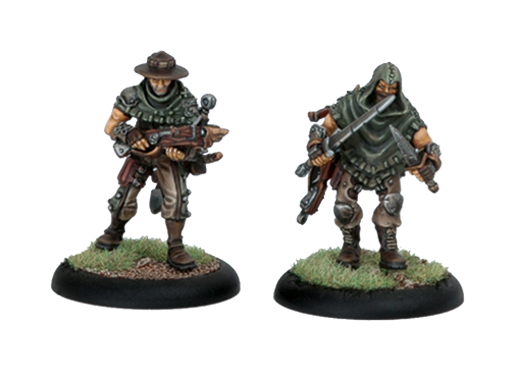 Most of Reaper's range is either individual adventuring heroes, grunts, or grand generals. Or wizards. If I were allowed to have a wizard as my warband leader, I'd be set. But no such luck. First, this guy is a "northern hero". On the plus side, he'd big and imposing, and seriously-looking. On the con side, he looks like the Arnie rendition of Conan, except with some actual clothing on. Cool, but more a crusher-of-empires than a leader-of-men. Looks a bit too young and in his prime, too. But I could model on some facial hair, maybe a cloak. This chap is a bandit, according to reaper. That's a big pro to start with. He looks suitably rugged and bulky for the part. And check out that mustache. Cons: hair looks a bit... meh. but that can be fixed, made more wild with green stuff. Also, he's got a shield, which isn't the best investment in mordheim. Not a deal-breaker, but something to keep in mind. A Pathfinder model, a fighter. He's not as bulky as either of the other selections, but he's far better equipped. Again, he looks a bit young, but some added facial hair can easily fix that. I had a look at some other miniature producers, but nothing jumped out at me as a serious option. 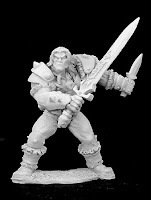 But this guy (from Hassle-Free miniatures) makes for a great non-serious option. Maybe I should get a scrawny wizard to go with him and the carnivorous treasure chest, to amuse my inner Discworld fan. These two (from Privateer Press) would make nice henchmen to match the sword-and-crossbow weilding half-orcs. I also had a serious look at the models I have which I could use to make other warbands with as few additional purchases as possible. Turns out I have so many plastic warhammer orcs, I could probably make three whole warbands without breaking a sweat. So long as I like my orcs wielding swords, bows abd more swords, that is. But I do, so that's fine. On the dwarf front, again, I have a passable number of models. Only problem is, they're from three different ranges, and as a result, are wildly different in their style and proportioning. For all that all dwarves act pretty much alike, they sure do manage to vary a lot. First, a single reaper dwarf hero I got at a convention. He's got a "viking" style horned helmet and a shield with a complex squiggly celt-y type pattern on it. His eye-level is about up to the shoulder of most human models. 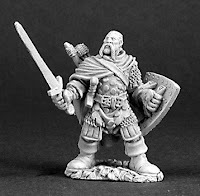 Second, four dwarves from WotC's attempt to revamp the Chainmail miniatures battle game. They've got Gimli-from-the-LotR-Movie style helmets, mostly, and their eye-level is about the upper chest of the human models, but they're noticably smaller in stature than the reaper model. They also have terrible posture. Third, six dwarves from game's warshop's Marauder line.... so, quite some time ago, relatively speaking. Their eye-level is belt-level for a human, and they're the most disproportionate of the lot. 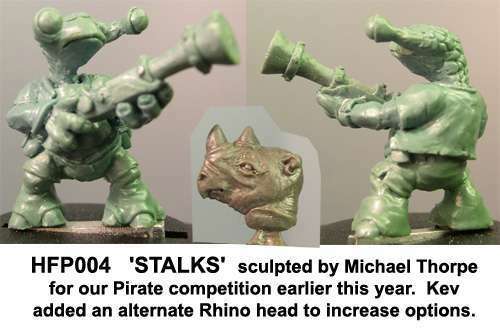 In fact, they seem to match the shape and size of a current warhammer halfling to a tee, including the bulbous noses, even if the hair is in different places. They're also wearing Renaissance-style garb, exactly like warhammer Empire models do. Maybe I'm being too picky.